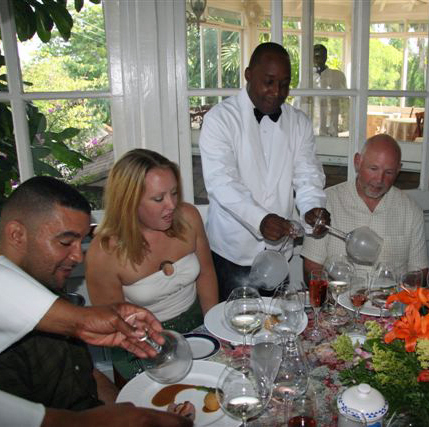 Graycliff Restaurant, one of the Caribbean's first Five-Star restaurants is offering a wine lover's dream. Wine Luncheon guests are welcomed with a glass of champagne and led by one of Graycliff's certified Sommeliers for a tour of the hotel and restaurant's acclaimed wine collection. The cellar houses some fine and rare wines, with over 250,000 bottles from 400 vintners, acquired over decades by Enrico Garzaroli, the establishment's Chairman and CEO. If you understand quality wines and appreciate their relationship to good food, then you have discovered one of the reasons for living," says Garzaroli. He is passionate about the quality of the wines he seeks out and carefully adds to his collection, which is among the largest private collections in the world, and third largest in the Western Hemisphere, receiving the prestigious Wine Spectator Grand Award since 1988. The Wine Luncheon participants are treated to a four-course, gourmet repast paired with the appropriate wines. The menu changes seasonally, but would include an appetizer, soup or salad, main course and dessert.